LOS FRESNOS — Detention Centers are filling up again – despite a drastic drop in illegal crossings at the border – with an increase in detentions of people who are already living in the country, some who have resided in the U.S. for decades. Immigration and Customs Enforcement officials recently announced a nearly 40-percent increase in immigration arrests this year over the same period last year. Between Jan. 22, and April 29, ICE officers arrested 41,318 people on civil immigration charges — compared with 30,028 arrests during the same period last year, a 38-percent increase year over year, ICE officials said. Apprehensions at the border have dropped by more than 68 percent during fiscal year 2017, with 210,309 apprehensions through April, compared to 306,578 apprehensions at the border in the same time period last year, October through April 2016, according to U.S. Customs and Border Protection data. 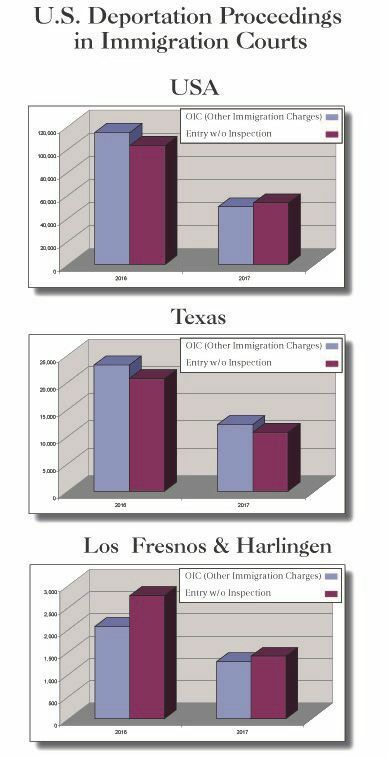 Locally, data suggests a slight uptick in the detention of people charged with entry without inspection in the Harlingen and Los Fresnos detention centers. When someone has already crossed the border and is detained while living in the U.S., meaning they weren’t caught at the border but apprehended at a later time – they are charged with entry without inspection. This could mean people who overstayed their VISAs or lawful permanent residents who are questioned about a prior criminal complaint. That data, according to the Transactional Access Records Clearinghouse (TRAC), a Syracuse University-based project that tracks data from ICE and other federal agencies, shows that so far in FY 2017 at the two local detention centers, 1,403 of the 2,678 detainees (52 percent) were charged with entry without inspection, or EWIs. The remaining 1,275 (48 percent) detainees were charged with a separate immigration charge, such as illegal entry and illegal re-entry, the data shows. Local immigration attorneys argue this is a shift since the start of the New Year from those being detained at the border who surrender or are caught crossing into the country, a regular occurrence up until last year, to more detentions of people living within the country who may or may not be here lawfully. In the past, those same people in similar scenarios were detained but not held in detention; instead they’d be released with a future court date, like any citizen, local immigration attorneys said. Attorneys said that now in some cases even those with lawful status in the country are subject to detention if they have prior criminal accusations. Carlos M. Garcia, a local immigration attorney, agreed he’s seen a rise in the number of people who are placed in local detention centers – and an increase in detention holding times. Garcia said the average times for someone fighting their detention, or attempting to fight it based on some sort of relief available to them, is at least a month or more. “So instead of fighting an immigration charge in a non-detention setting; more people are being held in detention centers until their cases get argued,” Garcia said. Garcia said a client, a man in his mid-60s and a lawful permanent resident since the 1980s, was recently detained returning from Mexico. The man had made frequent trips for decades and had never encountered issues returning to the Valley from Mexico until last month. Garcia said immigration officers at the bridge, who questioned the man’s criminal background, specifically a criminal offense from the mid-80s that did not result in a conviction, eventually detained him; he is currently awaiting a court hearing scheduled for next week. Daniel Bible, an ICE ERO Field Office director who said they were using 1,000 of the 1,200 beds in the Los Fresnos detention center, confirmed that they’ve seen a shift from apprehensions at the border to those within the country. Not only are detention centers filling up, but proof can also be found within local communities whose demographics make the residents more susceptible to increased immigration enforcement and being detained as EWIs. Alejandro Guerrero, a Mission-based immigration attorney, said he now spends at least three to four days visiting clients at the Harlingen and Los Fresnos detention centers. He said his business has increased at least 50 percent since the start of the New Year due to the fear of immigration officers enforcing Trump’s directive. A lot of the families who ask for Guerrero’s legal advice say they’re afraid to go out, in fear they will get stopped and subsequently detained, he said.